VNC is a great way to gain remote access to a server or PC desktop but it may not be the best performing method for all occasions. In those situations, I like to use Microsoft RDP due to it’s faster refresh and compression. The challenge is that Microsoft Remote Desktop (RDP) is not enabled by default on new server or PC deploys and there previously was no tool that could easily turn it on without already having access to the remote computer desktop. This article will show you how to enable Microsoft RDP remotely with the Bozteck VENM console. Enabling remote desktops can easily be done in only a few clicks from within the VENM console. Below are the system requirements on the remote computer side for this function to work properly. Notice that it also works for desktop operating systems as well as servers. Al of the above requirements are the typical basic requirements to remotely manage Windows computers. If needed, starting the Remote Registry service can easily be done remotely, also. A window will open showing the progress. Now that RDP is enabled, you can simply right-click on the computer and choose “RDP” and your session will open in a new tab. This entry was posted in how-to and tagged desktop, Desploy, Enable, Microsoft, RDP, Remote. Bookmark the permalink. 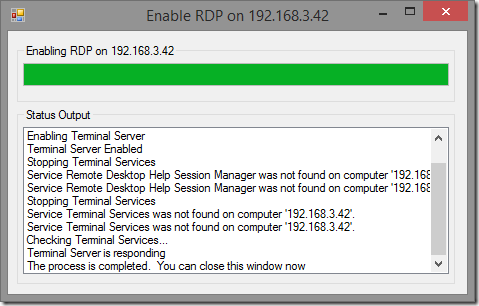 Is there a way to connect with RDP to a current users session to offer assistance? I am using UltraVNC for that now. Not that I know of but I will look into it and let you know.